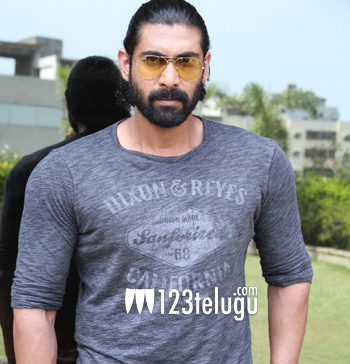 Macho man Rana Daggubati is playing a crucial role in the movie ‘Rudhrama Devi’. This film has Anushka as the heroine and Rana is going to be seen as a prince. The young hero says that director Gunasekhar first narrated the story more than 7 years ago. “Director Gunasekhar narrated Rudhrama Devi script to me more than seven years ago. I am happy to be working for such a historic role”, said Rana via his Facebook page. The film’s shooting is nearing completion and the movie might release in the second half of this year. Rudhrama Devi is a big budget project that is being produced by Gunasekhar himself. Maestro Ilayaraja has composed the tunes and a number of popular actors like Krishnam Raju, Nithya Menen, Catherine Tresa, Baba Sehgal, etc are playing key roles.